Home of the world famous Purple Turtle (well… at least Utah famous! ), Pleasant Grove has been an original pioneer town since Utah’s founding. It was first called Battle Creek after the pioneer & Ute battles, and now also boasts of the nickname “City of Trees” due to it’s beautiful greenery on every single street and around every corner. For decades there was a fort surrounding the citizens, and there are many remaining pioneer monuments. Pleasant Grove is served by Pleasant Grove High, several junior high and elementary schools, and charter school options as well. The G on the mountain is a proud monument to the “Grove.” In addition to the popular Purple Turtle drive in, Pleasant Grove features many delicious restaurants along the main drag of State Street. There are also small businesses and larger chains, like Walmart, which provide any service or shopping you could ever need. The Mount Timpanogos temple is a stunning feature of the area, and marks the border with American Fork. Pleasant Grove also has a fun community pool and city center. The City of Trees also gives you plenty of options for small parks and rolling fields anytime you want to get outdoors. Pleasant Grove has experienced phases of development, and is now experiencing a period of renewal. The high number of homes built in the 80s and 90s are in need of remodeling and updating. 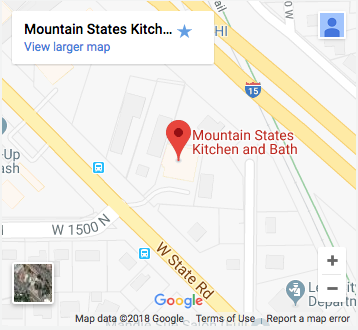 At Mountain States Kitchen & Bath we are local and knowledgeable about updating the homes you love and live in. Whether you want a remodel of your entire home, extending your kitchen, investing in custom cabinetry, refinishing a bathroom, or just want some options for more modern kitchen and bathroom options – you’re better off turning to a trusted local company than the big box designers. We’re Utah County locals who have served the Pleasant Grove area for years. We’re ready to help you!